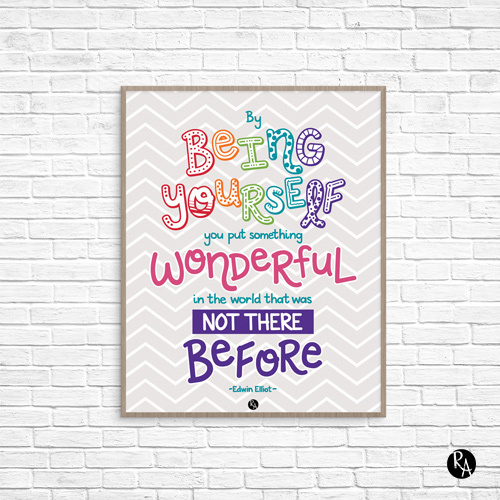 The quote I chose for this week’s printable wall art is a great reminder that we are all unique individuals that all see and understand the world from a slightly different perspective. But our uniqueness is what makes us shine in the world. Each and every one of us is a wonderful addition to the human race. We each have gifts that we can contribute to making the world a better place. It can be hard sometimes, but once we accept ourselves for who we are, warts and all, we have the chance to be the wonderful person that didn’t exist in the world before we did. And that’s a cool feeling. Use this printable wall art quote to inspire and encourage yourself or a friend in your home, office, dorm, or classroom. You can print it at home and hang it in a frame, with cute washi tape, or a fun thumbtack. Be creative!